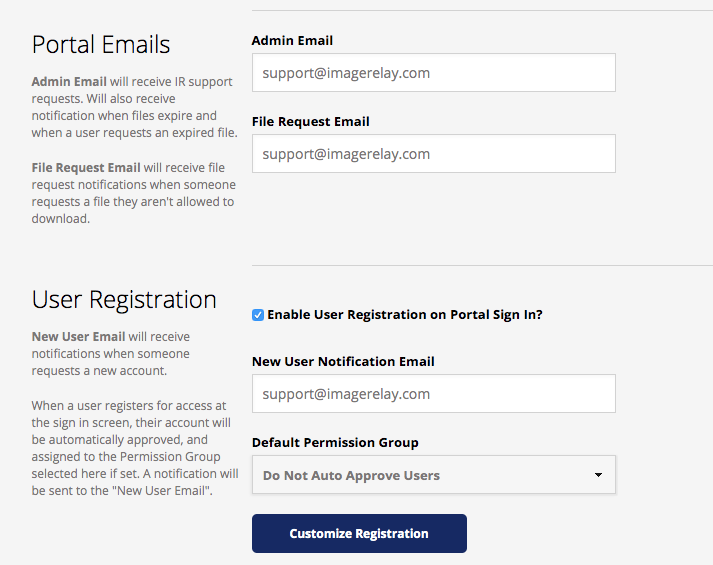 You can assign certain emails to certain tasks within the system. This is a Master Admin feature. If you do not have access to Account Settings you cannot update these contacts. By default the creator of the account will have their email address populating all the admin and billing contact fields. But you may want to edit who gets notified about these certain aspects, for example have billing invoices sent to your Accounts Payable department, or cc another user or group on a New User Notification? Admin Email refers to who will receive internal support requests via users that are reaching out for content questions in the Help Section. This contact will also receive notifications when files expire and when a user requests an expired file. New User Notification Email refers to the contact will receive notifications when someone requests a new account, or accepts an invitation. You may add more than one address here, separated by commas. This is a Professional or Enterprise feature. File Request Email refers to the contact will receive notifications when someone requests a file This is a Professional or Enterprise feature. Then Save your changes at the bottom of the page.